Joining Your Local Guild is a Good Thing! Well, yes, you knew that! There are lots of benefits to joining your local guild in whatever craft you do. There's a lot of interesting people who want to talk about the same thing you do, and are less likely to have glazed over eyes after the first minute on the topic. You make good contacts, and usually there are resources available more easily. But you also make the most important thing--friends. And sometimes just getting together and having an artistic play date can really help in ways you would never have imagined. Recently Renee Taylor (http://www.etsy.com/shop.php?user_id=5216872) and I got together just to play. Not only was it fun just because, but it was also a fantastic learning opportunity. Renee does lovely florals, whereas I am reasonably dot- and flower-challenged. I, however, am pretty good with presses, whereas Renee is press-challenged. So we swapped. I showed Renee how to roll (not press) a thin tube of glass into the press first, so that the ends are roughly 1mm from each side of the press. Then add glass, slowly--you always use less than you think! Renee showed me her dot technique, and under her good eyes I realized that I had had more problems because I was heating up too much of each rod's end, and making it much harder to place dots precisely. We finished up with pho at my favorite local Vietnamese hole-in-the-wall, Pho Truc, and need not to wait so long before doing this again. It was just flat FUN. 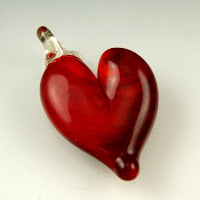 I haven't shown any new work for a while, so I thought I would share some pictures of heart pendants that I have been working on lately. I'll also leave you with an ear-worm at the end, so you Have Been Warned. Heart pendants are fun to make. 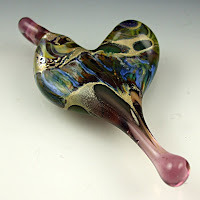 Sometimes they have long, graceful points with nice smooth ends, and other times one gets a short, fat, stubby heart. Like human beings, they're all beautiful in their own ways. The sole exception are the hearts with poor loops--thin and breakable ones, poorly attached ones, really fugly ones. Those I take out of my kiln and give to friends as window ornaments, or hang them from my fruit trees in a futile effort to keep the birds from getting all my plums! As I take them out of the kiln, I find myself singing, "Please take away my heart ... my poopy loopy heart ... "
Admit it. You knew that one was coming. If you get an earworm from it, don't say I didn't warn you! 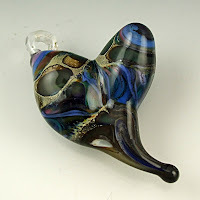 This weekend Art of the Firebird and I did a show at Amalgam Arts Studio in Atlanta. 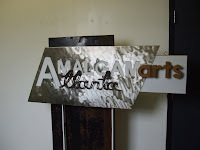 It's in the Rail Arts District of Atlanta--the Decatur, Scottdale, and Avondale area. The studio has a great group of artists and a wonderful vibe. It is a wonderfully creative community. Our show began with the Studio Cruise on Saturday evening, and completed with the trunk show on Sunday. We met some wonderful folks, and even did reasonably well! 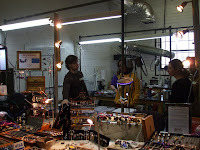 You can see the studio founder, Brian Gibney, teaching a class during the Sunday afternoon one-day jewellery making workshop during the trunk show. Our display is in the foreground. Brian is a good teacher; I know I learn so much just by observing the class and listening in!